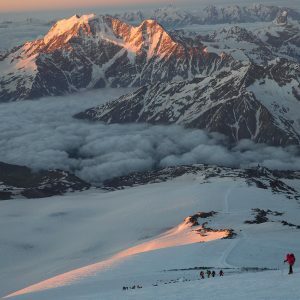 Want to learn more about climbing Elbrus, the highest mountain in Europe? Contact us today and we will give you all the info you need. 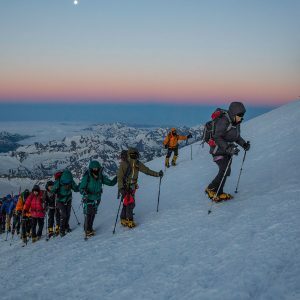 Join Mountain Professionals for a climb of this beautiful and accessible mountain in the heart of Baksan Valley of the Caucasus Mountain Range. First climbed in 1829, Mt. 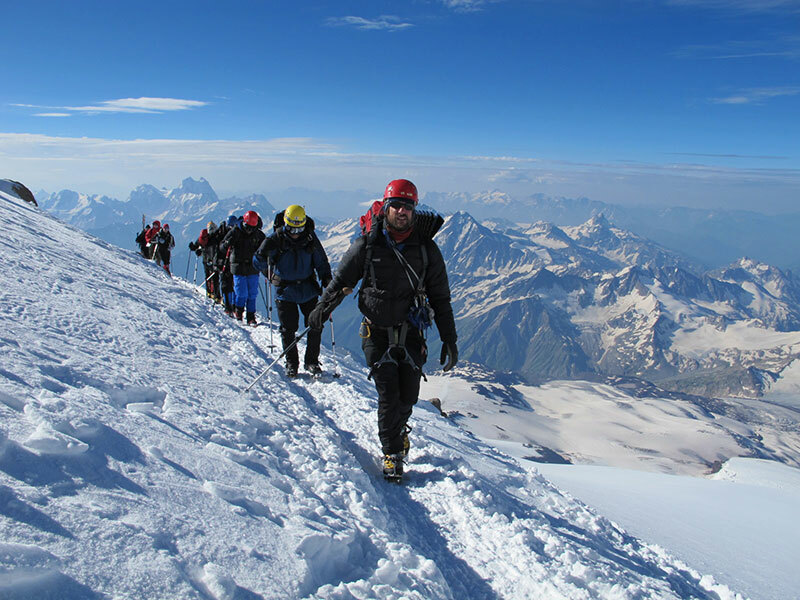 Elbrus is the highest mountain in Europe and an excellent experience for the aspiring mountaineer. 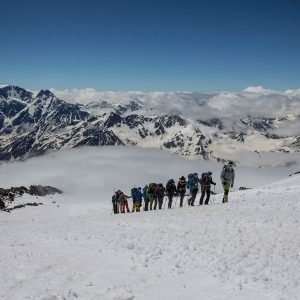 Standing 18,510 feet above sea level, Elbrus is the perfect challenge for those who have had some experience with mountaineering and are looking to test themselves at high altitude or on the 7 summits quest to climb all of the highest summits on each of the seven continents. 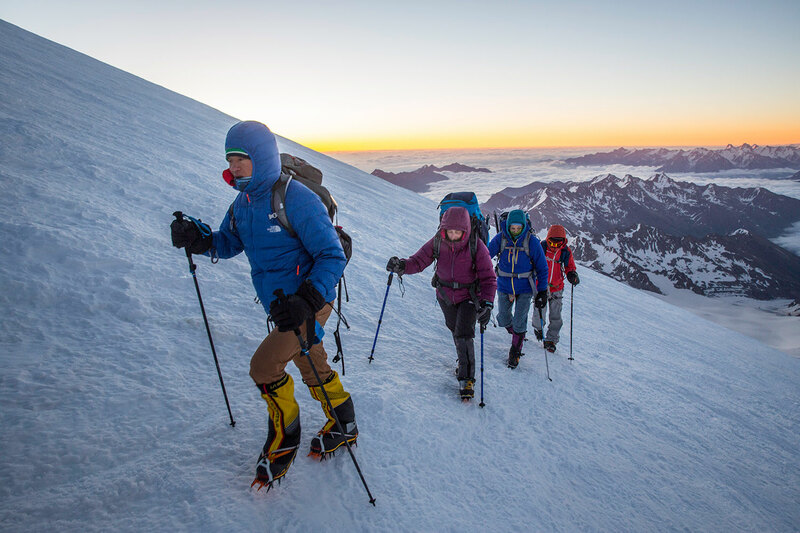 Elbrus is a great next step on the road to peaks such as Aconcagua with Mountain Professionals. 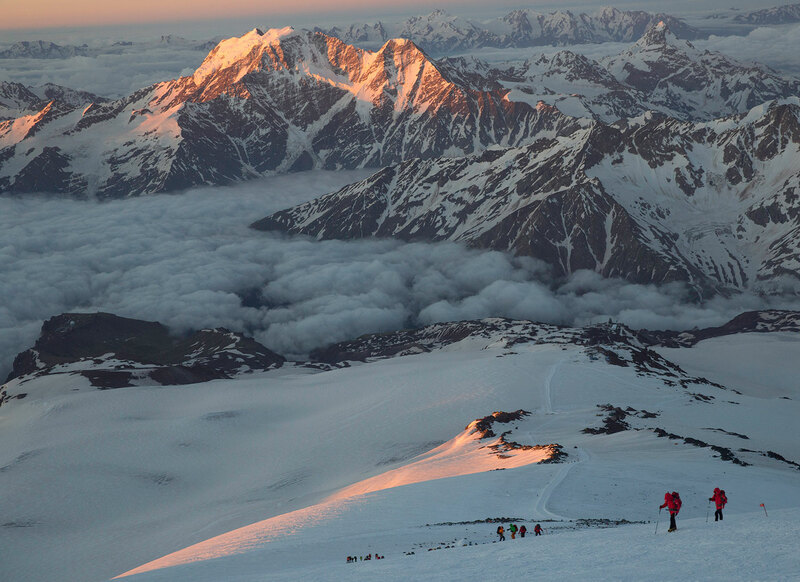 Elbrus is accessible from Moscow via an internal flight to the town of Mineralnye Vody. From here we take a 3 hour private van transport to the mountain village of Cheget and acclimatize in route to the mountain. 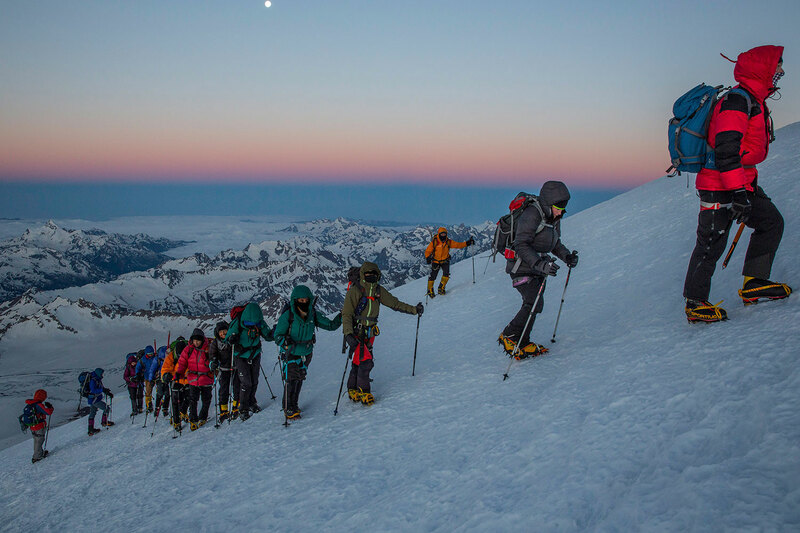 We will spend several nights in the village to take in the views and culture before making our way to the start of the climb. A short drive brings us to the base of the mountain and a cable car ride to the Low Huts. Here we will take a day to relax, hike and acclimatize. 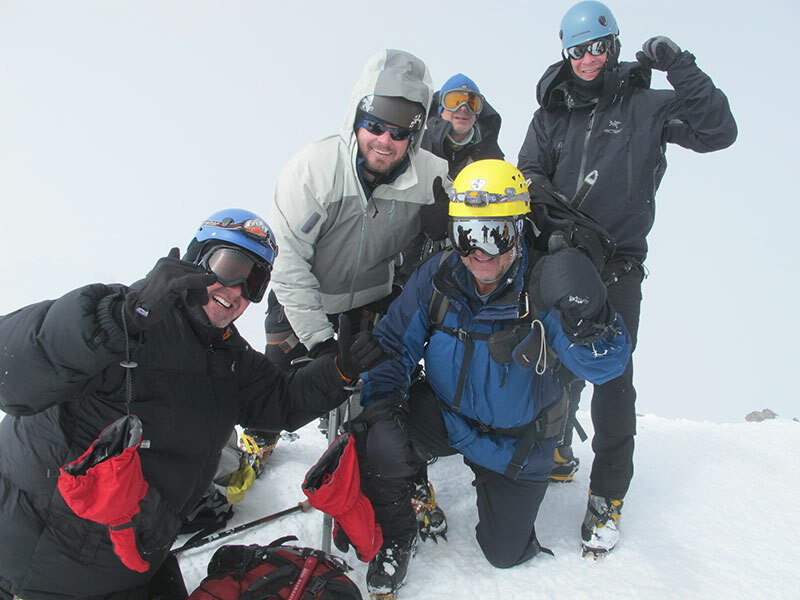 The following day we will ride an additional chairlift up to our high camp location at the Pruit Hut. 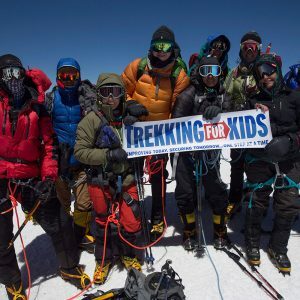 This will be our base for the climb to the summit. 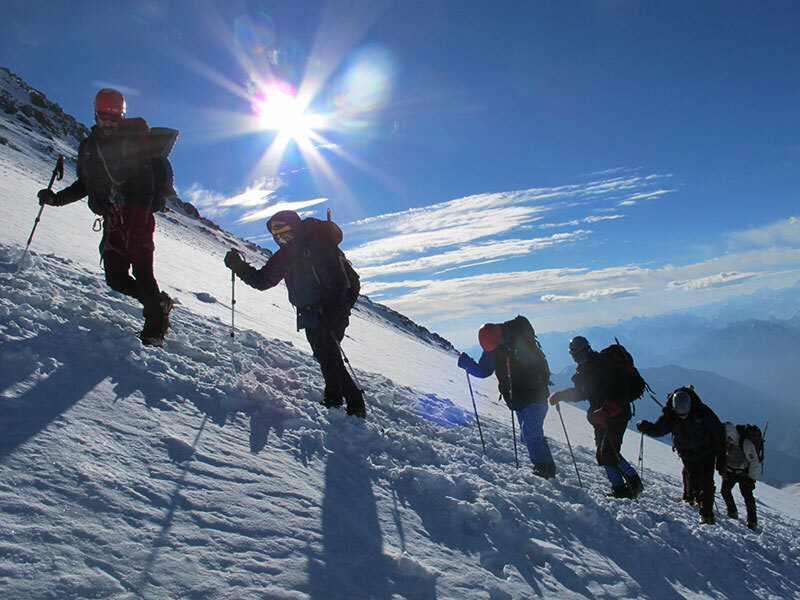 We will use the slopes above to acclimatize and review basic skills. 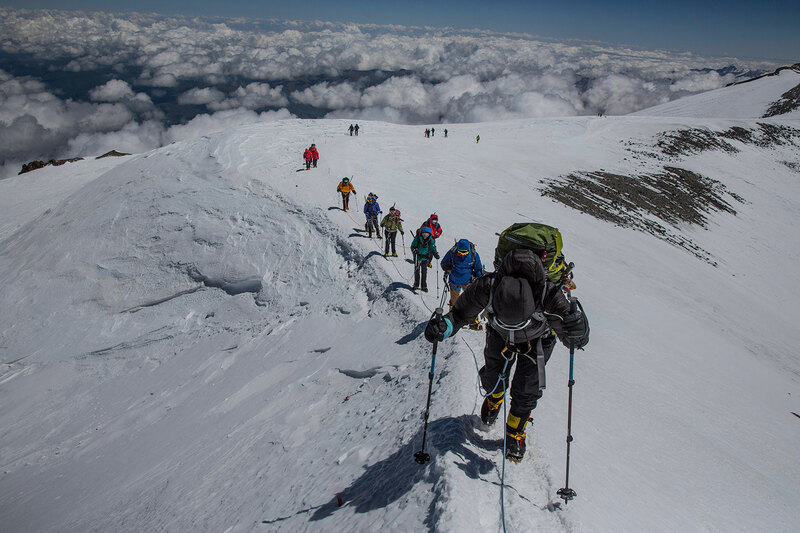 From the hut we will make a final climb up to the Pastokhov Rocks at 15,000′ in order to properly acclimatize prior to our summit climb. The route travels via moderate snow and ice slopes up the glacier. 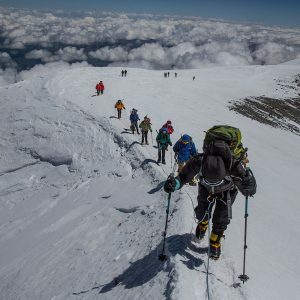 After several hours ascending snow the slopes above Pastokhov Rocks, we begin to traverse toward the saddle between the East and West summits. 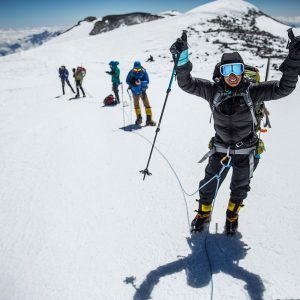 A traverse along moderate terrain, leads to the West summit of Elbrus. 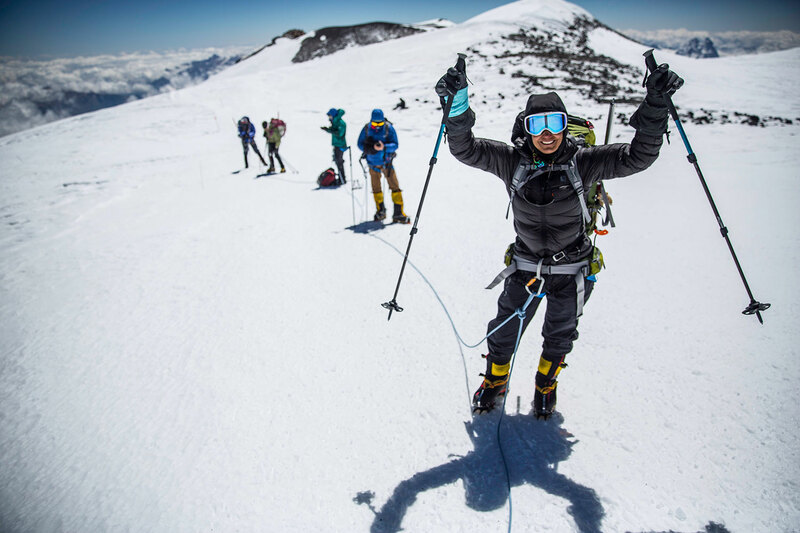 After the climb we will join in a celebration dinner back in the hotel and then transport back to St. Petersburg for the culmination of the expedition. You are free to build in extra time and see this amazing city, which is one of the most popular tourist destinations in Russia. Day 3: Transport to Mineralyne Vody via internal flight and hotel in Baksan Valley, Hotel Night. 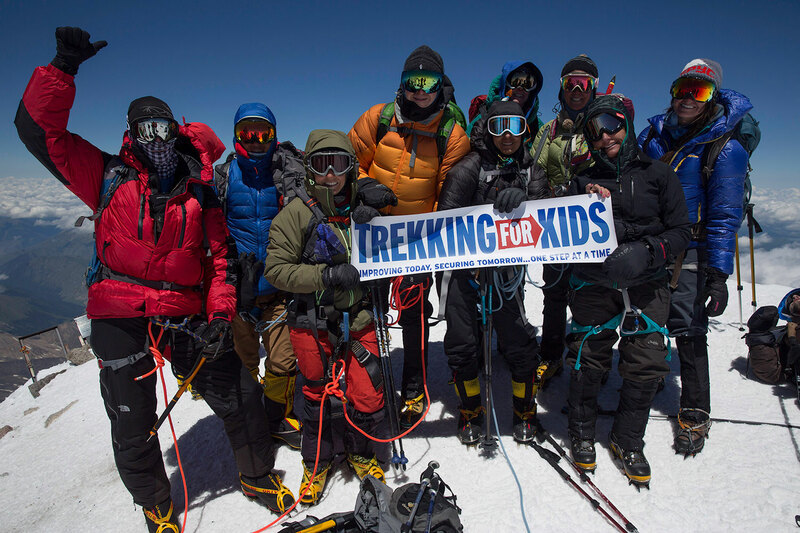 Day 4: Day hike and acclimatization via chairlifts in Cheget up to 11,800 ft. Hotel Night. 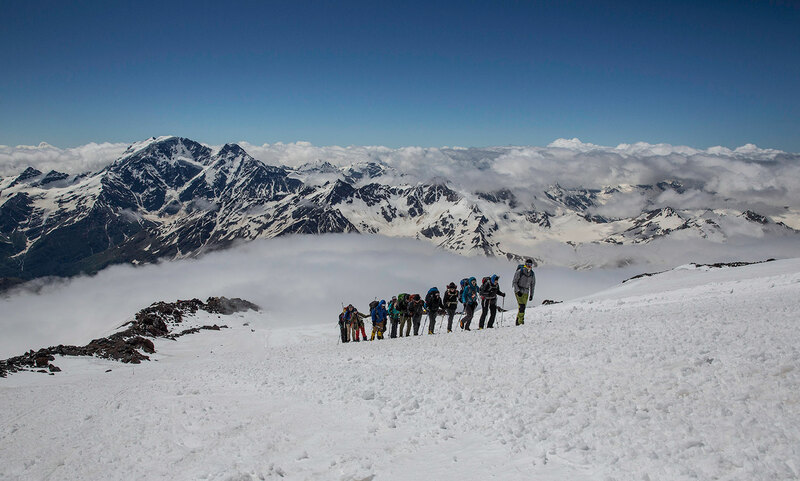 Day 5: Ride the cable car to toward the Low Hut, acclimatization walk on Elbrus, Hotel Night. 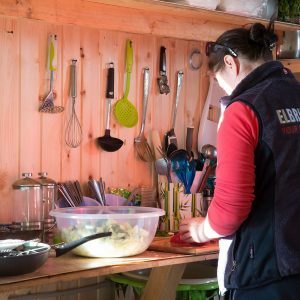 Day 6: Ride the cable car to high huts, use this hut as base for our climb 14,000 ft.
Day 7: We climb to acclimatize to the Pastukhov Rocks located at over 15,000 ft.
Day 12: Transport to Mineralyne Vody airport and return to St. Petersburg hotel, visit the city. 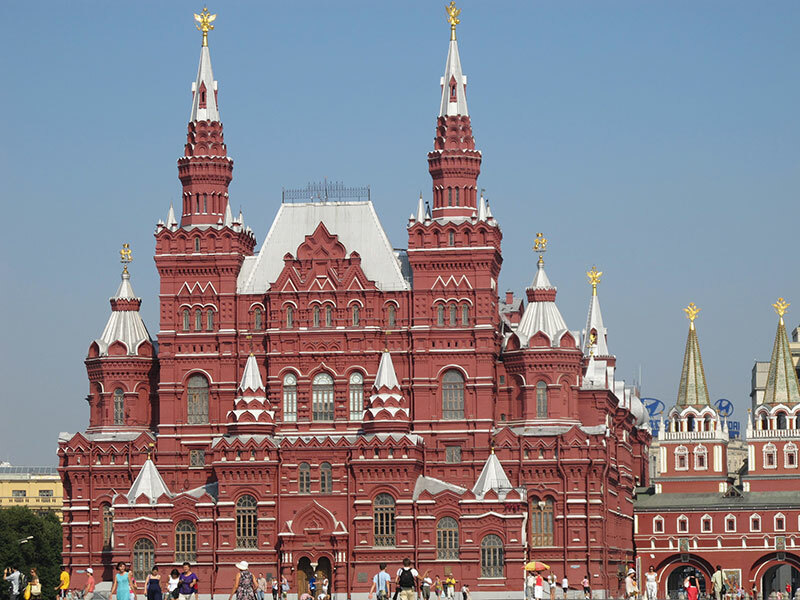 3 Nights accommodation in Moscow/St. Petersburg at a 4-star hotel. Airport pickup upon arrival in Russia. Internal domestic flights and transports to/from Mineralyne Vody. Baksan Valley hotel all nights in Hotel Povorot. 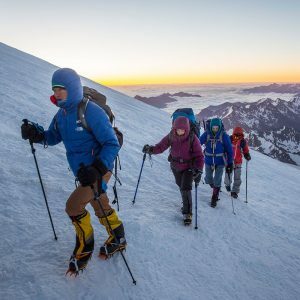 All hut or camping fees for the climb. 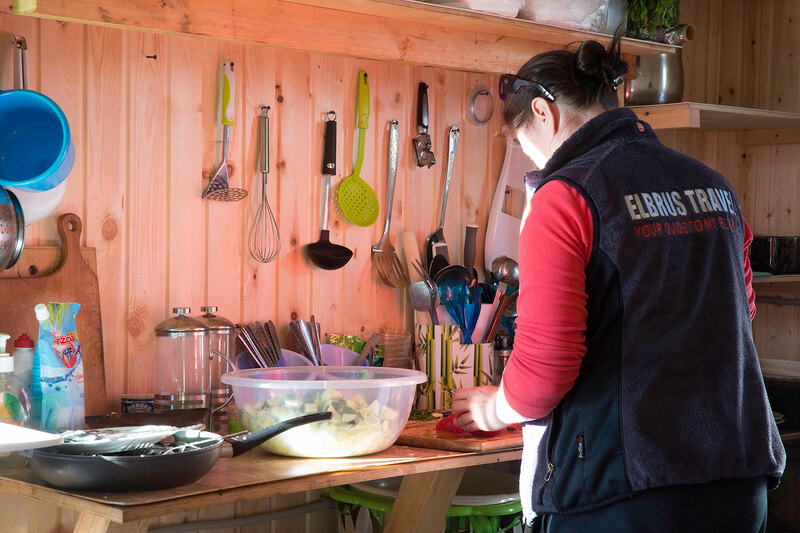 All meals and cooking utensils on mountain. Snow Cat transport on summit day to Pastukhov Rocks. Personal clothing and climbing gear. Excess baggage fee on Domestic Flight over 20 kg. limit.